I made this little Stephen West shawl about a year and a half ago. 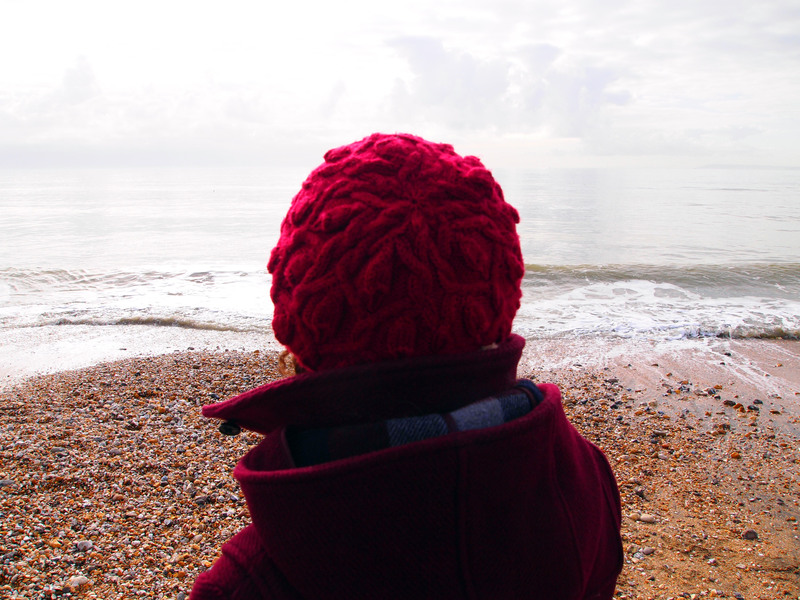 I started it on a trip to Cornwall with friends, and did a little bit of knitting on the beach (though it wasn’t particularly warm! ), hence the name. 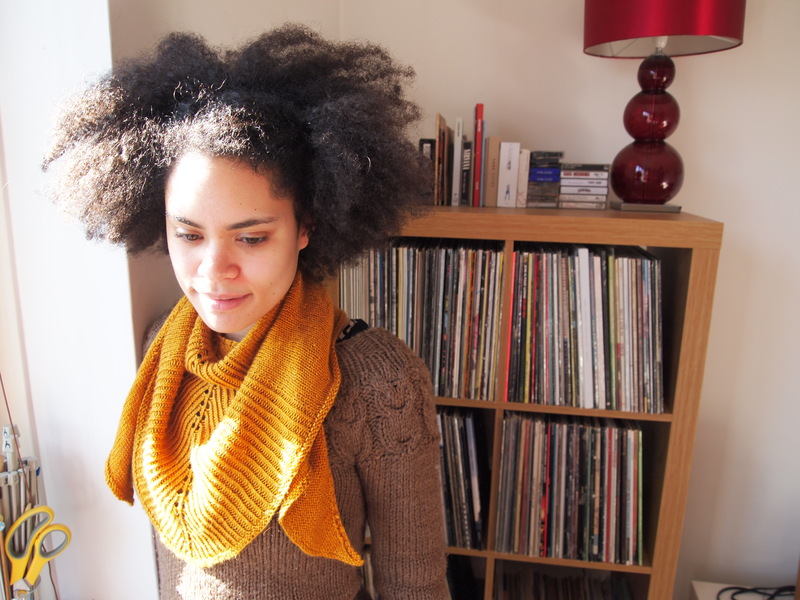 The shawl is a really great shape, more like a scarf really, and so easy to wear. Blogging about it has made me want to get it out again and wear it before it gets too cold! It is a really versatile little piece and although light, surprisingly warm. However, the real highlight of this project was the yarn. It is a blend of camel and silk by travelknitter. (Just going to her etsy store makes me want to buy more now!) The colour is a beautiful golden yellow and it is so soft (the camel) with amazing drape (the silk). 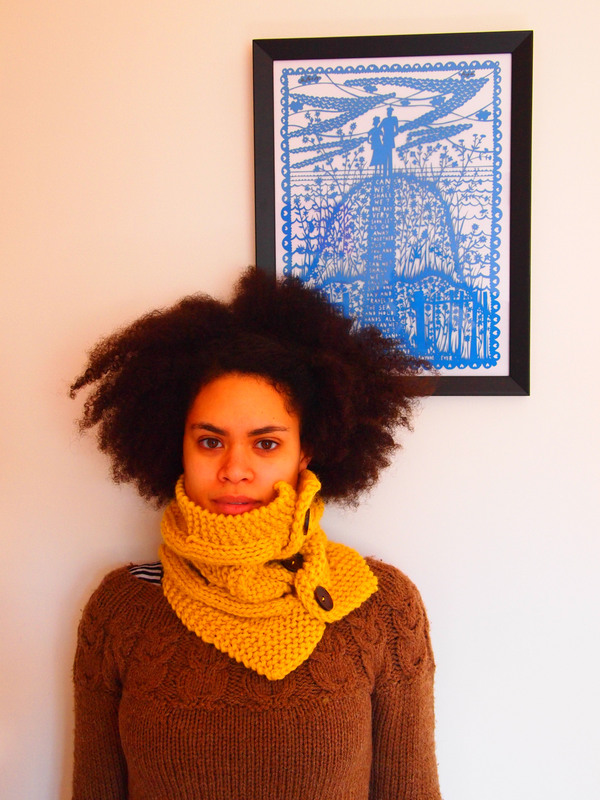 She is local to me in East London and hand dyes all her yarn. I bought the 4 ply camelsilk at a sheep shearing event at Spitalfields City Farm. Here are two of the more interesting characters we saw! The farm is a lovely place with many different animals, not just sheep. 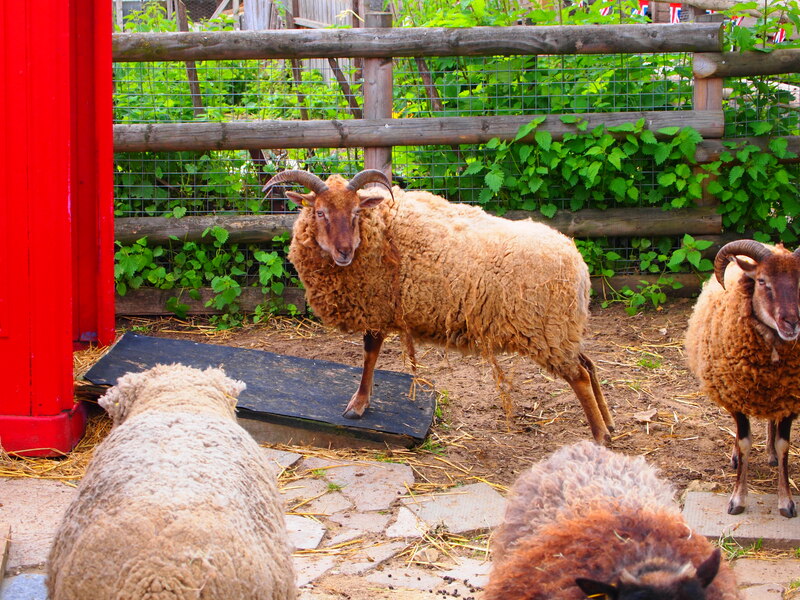 There are several city farms near where I live and they are all great community projects. It is always nice as a Londoner to go and visit, see the animals, and feel like there’s a little bit of the countryside in the city. 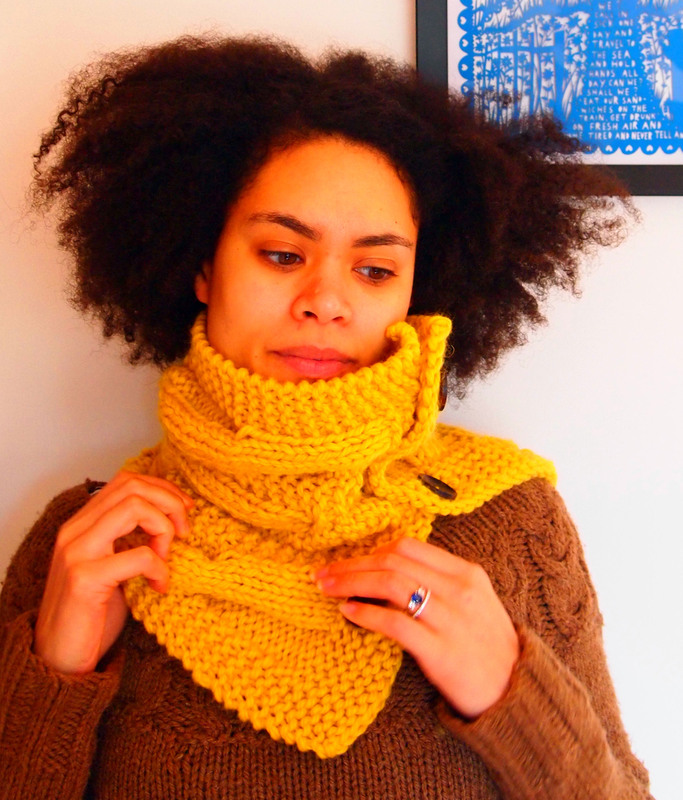 I made this sunny yellow cabled cowl in February for my big sister’s birthday. It turned out so well, I think I may have to make one for myself next winter. I’d wanted a quick knit, so chose this bulky weight cowl and as with the baby knits, I decided to choose a bright colour to pierce through the winter gloom. The yarn I used was Rowan Big Wool and I only used a ball and a half. As I bought three, there is plenty left over to make another one. 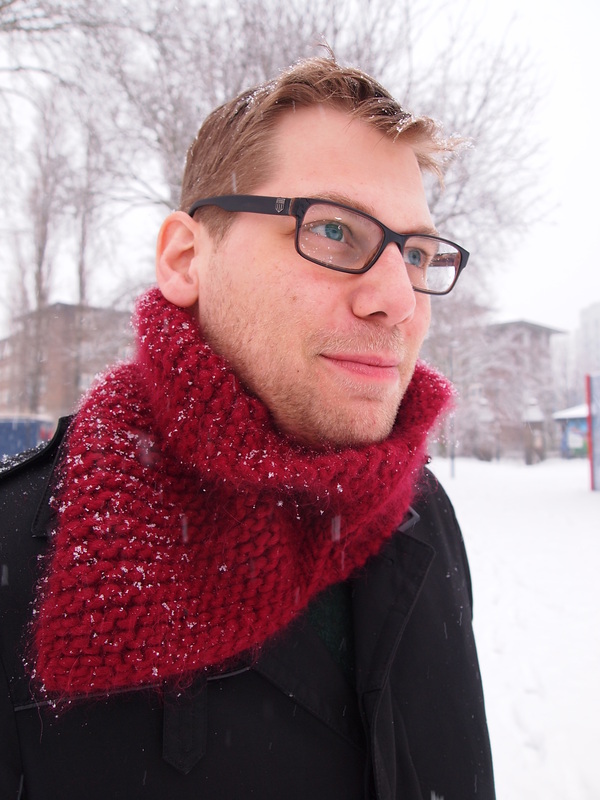 The pattern is Happy Solitude Cowl by Veera Välimäki. My version turned out a bit smaller than the one in the pattern, but I think this may be because I got bored of knitting the repeat so cast off sooner than I should! It was a quick knit; it only took me a week or so to complete. There is no seaming and all shaping is cleverly done using short rows. The buttons were from Joyafibers on Etsy. I have ordered a few times from her so far now, and I have been really pleased each time. It is also very versatile as you can wear it partly unbuttoned to have it covering your shoulders or button it all the way up for a super snuggly neck. This knit is so old that I have even forgotten which year I made it in! My best guess is either 2010 or 2011. Although I may not remember finishing it, I do remember purchasing the yarn. I bought it in Istanbul in February 2010. I try every holiday to buy some souvenir yarn and this was one of a few “souvenir skeins” from Istanbul. I bought it from a place called Kürkçü Han, a market square near the Grand Bazaar. (See this wonderful blog post here, with pictures and details of how to get there.) The whole square is full of stalls selling clothes and yarn, mostly cotton and acrylic. However, upstairs on the right is a yarn shop where I found a wider selection. This yarn is a bamboo cashmere blend (35/65) by Nako in a lovely dark red colour. I made a terrible attempt at bartering; my husband tried to help me, but I ended up too embarrassed in the end and paid full price. Nevertheless, I remember it being fairly reasonable. When I got back home, this yarn was duly added to the stash, not to be picked up again until I was looking for suitable yarn for a travel project. I thought it would be rather apt to use souvenir yarn for such a project, it was the correct weight and I loved the colour. With hindsight, using a bamboo blend for a hat was perhaps not the best choice, but the hat does have lovely slouch. 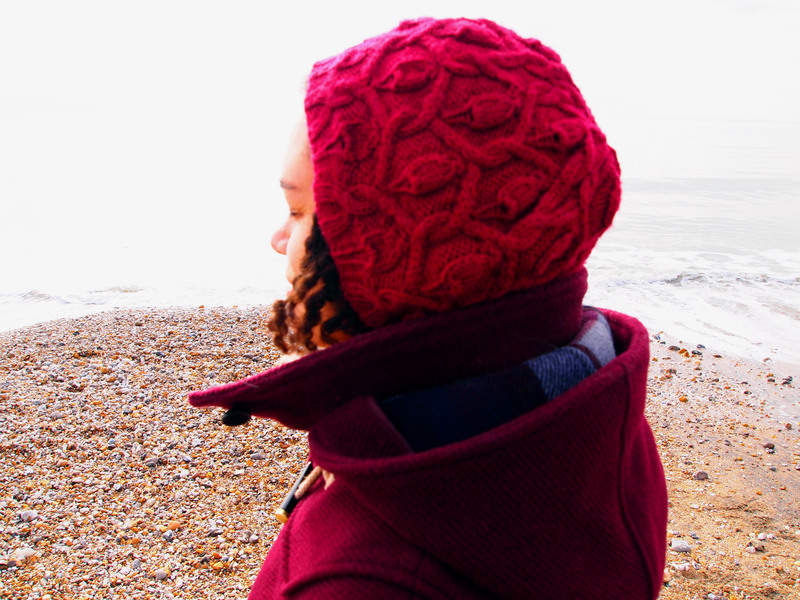 The pattern is Snapdragon Tam by Ysolda Teague from Whimsical Little Knits 2. I had previously made the Snapdragon Mittens (still yet to be photographed and now worn so much they are literally falling apart!) so decided to make the hat to accompany them. It was a straightforward knit and didn’t take too long. I remember blocking it over a plate to help set all the cables nicely. And there you have it! I don’t actually wear it that much as I tend to have my hair out these days and so wearing hats is not usually an option. However, when I do have it braided, my head gets cold, so a hat is most useful. The pictures accompanying this post were taken on the south coast near Portsmouth on a sunny but chilly February morning earlier this year. I feel like I have finally emerged from the longest winter. The sun has finally come out here in the UK and the clocks have moved forward giving us longer lighter evenings. I feel like the cloud we have been living under has been lifted and I have renewed energy again. As spring has finally sprung, I felt it was time to catch up with all my knits! Although I try to photograph and note as many projects as possible, plenty slip by without documentation. With a full time job it is difficult to find the time and light in the winter months to photograph all my projects and so even years can pass by before I get round to photographing some projects. So I plan a series of posts over the coming days and weeks to document these lost knits. The first today are some baby clothes I made in January of this year. 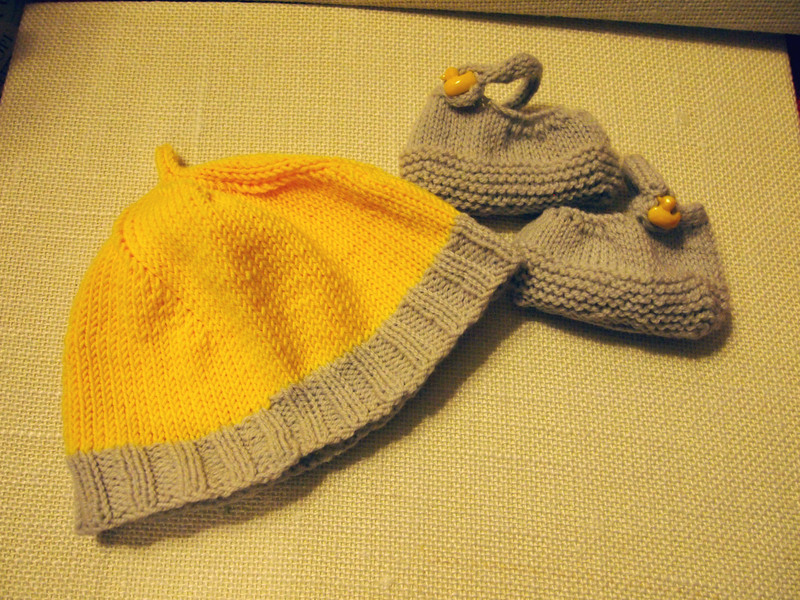 They were quick and easy knits which I made for my husband’s cousin’s new baby Toby. Before he was born, I didn’t know if he would be a girl or a boy so chose neutral colours. I dislike pastels however, so chose a bright sunny yellow and what I thought at the time was grey, but actually turned out to be a soft lavender once I got it home. Although this sounds like a strange combination, they actually worked well together. 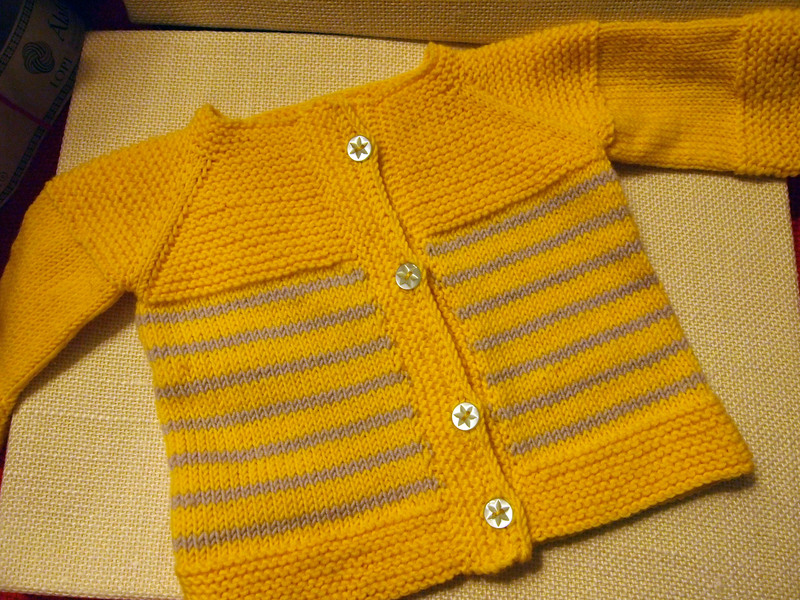 The yarn I used was MillaMia Merino, a swedish yarn company, and the pattern I used was Garter Yoke Baby Cardigan by Jennifer Hoel. It is a good choice for children’s knitting, as it comes in lots of bright colours and is superwash. It is also quite tightly spun resulting in a lovely crisp fabric particularly in garter stitch. This will also hopefully mean it is less likely to pill. This was a very simple pattern which I have used before. I like it as it’s very gender neutral, so great for people who don’t know the gender of their baby or who are not blue/pink fans. To accompany the cardigan, I made a simple baby hat: The Fresh Picked Baby Hat by Leslie Clarkson. This was a free pattern on Ravelry and I chose it for it’s simplicity and again gender neutrality. The baby booties were Tiny Shoes by Ysolda Teague from Whimsical Knits 2. I really love this little accessories book (and the first one) and have knit nearly everything from of it! These shoes were such a quick knit, only taking an hour or so, providing such instant gratification I could see them becoming addictive! These were also a good stashbuster as I used left over Quince&Co from my Chickadee cardigan. The rest will turn into hexipuffs. Apologies that the photographs are not my best. I had to snap a few quick pictures late night before sending them off in the post. They were well received, and we got to see a very happy baby Toby sporting his knitwear a few weeks later. Watch out for more lost knits coming soon. Wham Bam by Susan Chang is my latest project to be photographed. I have rather a back log of projects to be captured on camera, as at this time of year in England, we are rather deprived of decent sun. However, this weekend, we had our first snowfall of 2013 and I decided to seize the moment and my husband to take some pictures of my Wham Bam. Or should I say his Wham Bam. I made this cowl as a quick project back in October. The yarn used is a brand called Kurt Hesse Alpalana which I acquired in Berlin in 2011. Sadly, I’ve not been able to find out much about it online, or an online retailer, which is a shame as I’d love some more! It is a gorgeous wool alpaca blend, really loosely spun making a wonderfully light and soft fabric. Garter stitch was the perfect partner to this yarn, and as I was knitting it, I constantly kept squooshing it in my hands as it just felt so good! With huge needles too, this project flew off the needles in under 24 hours. 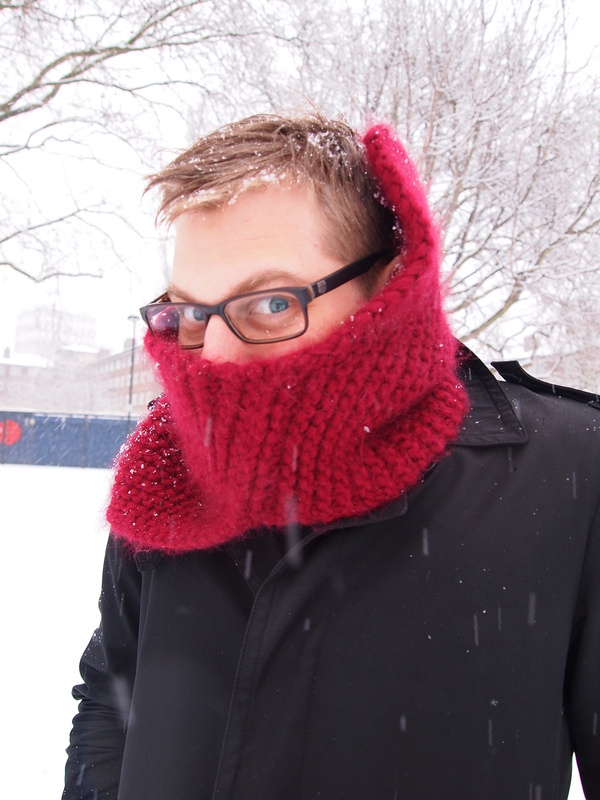 This makes a great, warm and squishy cowl, which you then have to fight over to see who gets to wear it. I think I have lost that battle though. Guess I’ll just have to make another one then! 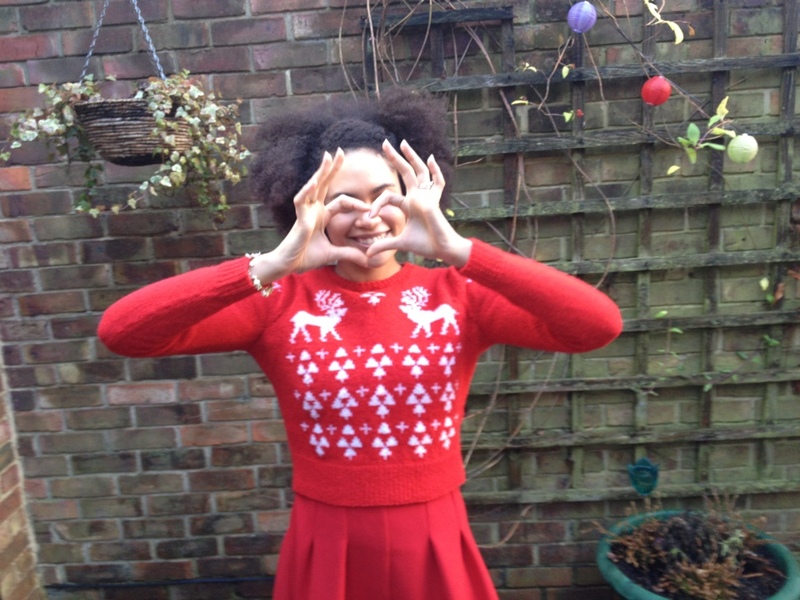 Here I am on Christmas Day dancing for joy in my new Christmas Jumper. 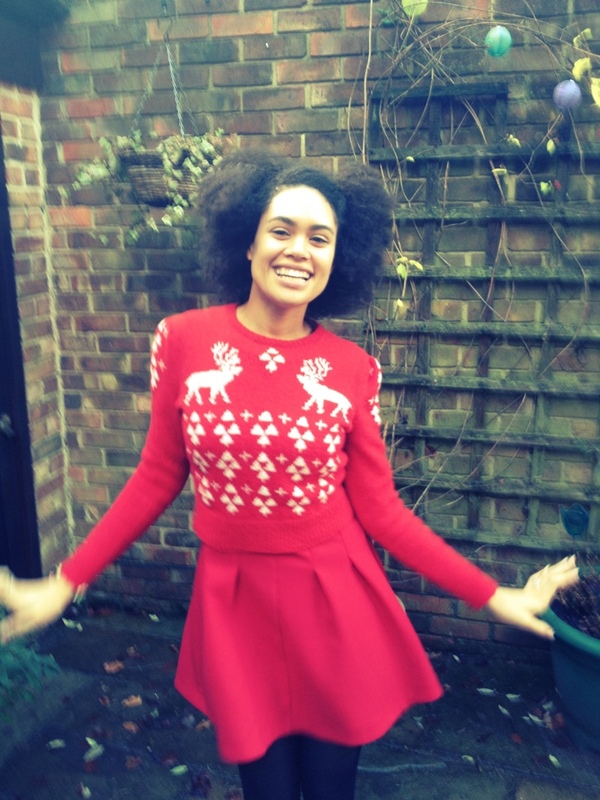 This is the Perfect Christmas Jumper by Susan Crawford. I started this at the beginning of December and in my eagerness neglected to swatch (who needs to swatch when you’re using the called for yarn, I scoffed!). A week later, I had a three-quarter completed jumper which was not the right size. Except, it took me a little while to accept this. I even sewed up the side seams! I think it took my husband’s diplomatic assessment that perhaps it was too big to make me face the facts and rip back. So…with a steely determination I cast back again with less stitches and turned into a veritable knitting machine for a week and managed to finish this on Christmas Eve! The modifications I made were to add waist shaping (I really need this in my sweaters for them to look flattering) and make the sleeves narrower (I prefer a close fit). What this knit has taught me (other than always swatch) is that I am rather particular about the style of sweater I choose to wear and that I need to be aware of this when knitting other people’s patterns and modify them accordingly. I found stranded knitting rather challenging but effectively knitting the sweater twice helped me to perfect my technique. I struggled with tension especially over those very long floats at the beginning, but definitely settled into more of an even rhythm over time. I was unsure about how to treat the stitches at the ends of each stranded section. I ended up wrapping as you do for intarsia. Whether this is correct or not, I’m not sure. But then most traditional stranded work is done in the round, so maybe a hybrid of the two techniques is what is required here. If anyone could explain this to me, I would be most grateful! Nevertheless, I enjoyed the challenge this sweater posed for me, and would like to try more colourwork projects in the new year. 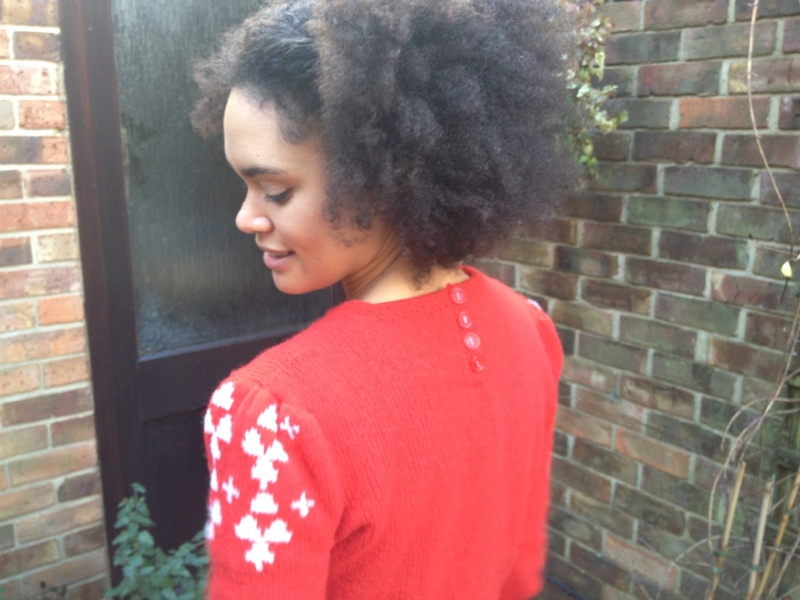 You can find my Christmas Sweater of Joy on Ravelry here.